NECRC continues to work with stakeholders to address the needs of the North End Community through the development o partnerships, networking and building community capacity. One of the key principles of our development philosophy is “to empower local people in the governance of the community economic development organization and of the community as a whole”. NECRC works to accomplish this by taking comprehensive approach to community development. As we engage with our partners towards community renewal, we incorporate an approach that is comprehensive, holistic, multi-sectoral, long term, inclusive, asset based, and most importantly an approach that promotes community process and outcomes. 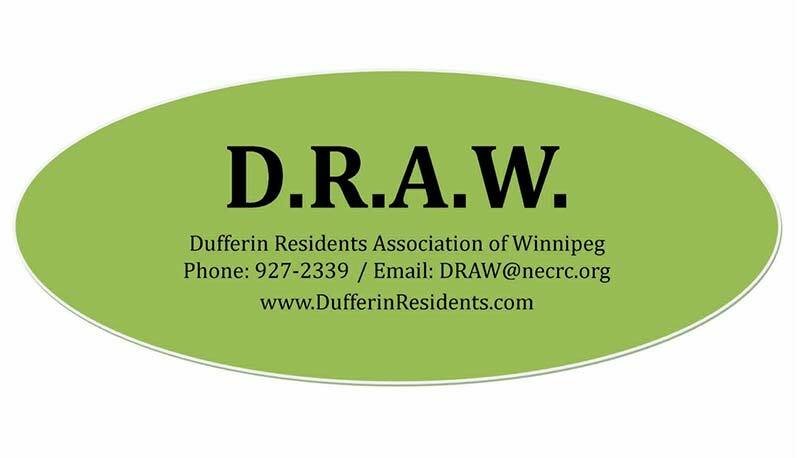 The Dufferin Residents’ Association of Winnipeg Inc. (DRAW) is a not-for profit organization of people from the Dufferin Community. We are a diverse group of people dedicated to engaging all cultures and generations in our vision, mission and objectives. The Mission of the DRAW is to promote values that support the health and unity of our community by using existing resources and creative innovation. We are dedicated to promoting pride, honoring our rich multi-cultural and multi-generational heritage, and providing the community with opportunities for leadership. The Vision of the DRAW is a safe, clean, nurturing community for all people who live, attend school, work or visit in Dufferin. The boundaries of the Dufferin are Selkirk Avenue to the rail yards (north to south); Salter Street to McPhillips Street (east to west). We are a community volunteer group that is looking to build friendships, community ties, improve safety and relationships, beautify our neighbourhood and promote positive events. Our meetings are the 3rd Wednesday of each month at 7 PM in Win Gardner Place – 363 McGregor Street. We organize and host workshops and events for the community, anything from art (screen-printing on throw pillows, jewellery making), Healthy cooking workshops where participants go home with a ready made nutritious meal for their family, to partnering with local schools to provide events to raise awareness and create openness around the issues facing youth. We facilitate community garden space during the summer and host a number of garden workshops and harvest celebrations. Community members have a chance to learn new skills, build relationships with their neighbours, and create a stronger community that work together to solve problems and create a safe positive space. The St. John’s Residents’ Association is currently engaged in developing a St. John’s 5-year neighbourhood plan. Together with a consulting firm, working to engage community members and stakeholders to create a dynamic plan that reflects the opinions of all St. John’s community members. Community members bring concerns on issues of Safety, Housing, Conflict with neighbours, Sidewalks and Street lighting, Yard maintenance for those with challenges as well as requests for parenting support and family issues. We work closely with community partners in the North End and refer community members to experts and advocates that specialize in those area. SJRA develops working groups to address these issues at the community level, looking for comprehensive and sustainable strategies with the hope of contributing to systemic change as well.